The USS CASCADE (AD-16), a Civilian Conversion to a Destroyer Tender, was commissioned on 12 MAR 1943. 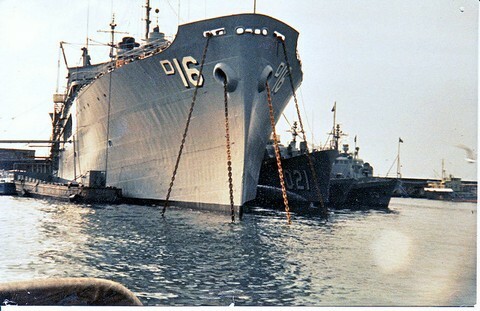 USS CASCADE served her country for 31 years, 8 months and 10 days, until decommissioned on 22 NOV 1974. Commissioned in the midst of WW II, CASCADE headed west to tended to the war effort against the Japanese. Moving towards Japan in steps, CASCADE finished the war on occupation duty and returned to the US in March 1946. She was decommissioned in 1947 and placed in reserve. CASCADE was recommissioned in 1951 and through 1974 tended the East Coast based destroyer squadrons. She routinely deployed to the Mediterranean and was homeported in Naples, Italy from March 1971 to October 1974. Upon her return to the US, she was decommissioned in November 1974 and then scrapped in 1975-76. FEB 1966 - APR 1966 Recovery of lost H-bomb off coast of Palomares Spain.